Hello! Welcome To Hooter's Rubber Band Ball Site!!! For Those Of You That Don't Know Me... I am Scott Bartlett Of Fremont, Ohio And Yes I Am Going For The World's Largest Rubber Band Ball!!! I Am 15 Years Old... What My Rubber Band Ball? Oh Damn You Rubber Band Ball... Always Taking The Spot Light! 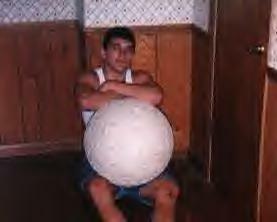 My Rubber Band Ball Was Born On January 7, 2000 And Currently Weighs 140 Pounds!!! People Ask Me "Why The Hell Do You Build A Rubber Band Ball?" Because It Is Tight! If You Would Like To Help Me On This Project Please Donate To Me "Please Only Send Checks Or Cash" Because Regular Size Rubber Bands Don't Fit The Ball. *Please Dontate! If You Dontate I Will Put Your Name, Email, and Amount Donated If You Want Onto My Site! Thanks! *I'm Looking For A Sponsor! If You Are Interested, Or Know Anyone That Might Be Interested!!! E-Mail Me!!! Visit My Masking Tape Ball Site!!! Unoffially The World's Largest!! !